Students dance at the 2017 Dance Marathon. Evanston MashUp awarded NUDM and Evanston Community Foundation on Tuesday, citing the organizations’ community partnership. Northwestern University Dance Marathon and the Evanston Community Foundation received awards at the eighth annual Evanston MashUp on Tuesday. The organizations received the Evanston/Northwestern Catalyst Award, an annual award given to recognize people and organizations with committed partnerships between NU and the city. Evanston MashUp launched eight years ago to help improve relations between the Evanston and NU communities. 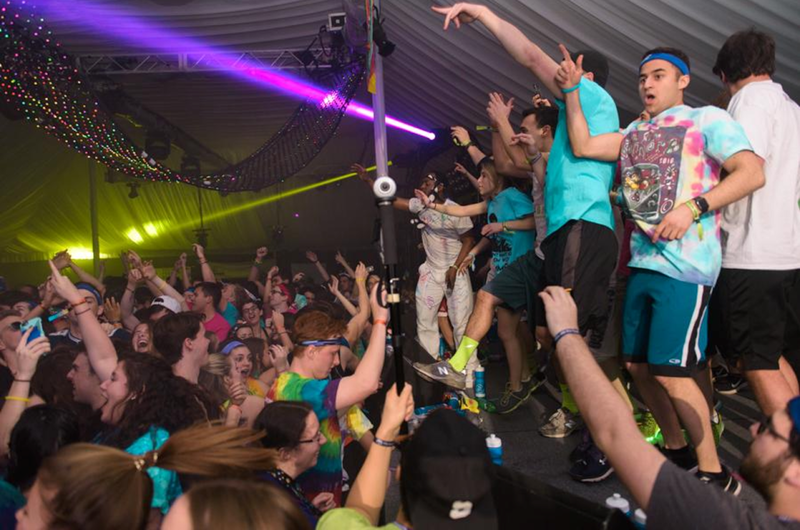 Each year, the event brings members of both communities under one tent behind Norris University Center, not unlike that set up each winter for NUDM. NUDM executive co-chair Daniel Nussbaum, a Weinberg senior, accepted the award. He said receiving it was an honor for the organization. “(This award) represents the hard work of those who came before us and what they put into fostering a positive relationship with the Evanston community and giving back to the community that we call home,” he said. NUDM has partnered with ECF for more than 20 years and gives 10 percent of its proceeds to the foundation each year. In March, NUDM donated more than $109,000 to the foundation — the largest donation NUDM has made to ECF. MashUp co-chair Jay Ryan, who organized and emceed Tuesday’s event, said this year’s MashUp was the most well-attended with more than 700 people. Amy Monday, ECF’s development officer, was also on stage with Nussbaum to accept the award. She said the partnership with NUDM has been instrumental to the foundation’s success. In May, NUDM announced ECF will again serve as its secondary beneficiary. Nussbaum said he is excited about the future partnership of NUDM and ECF. He added that he hopes to increase NUDM’s involvement in the Evanston community.